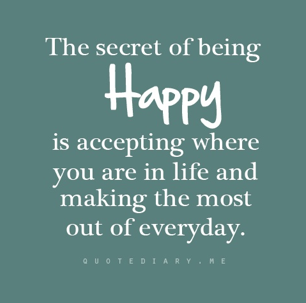 In this quote found on My Dream Sweet Love, we are reminded that happiness is accepting where we are and making the most of everyday. We will each have ups and downs in our lives and how we handle them will affect our happiness. We can't let the small drawbacks in life affect our day. Take a minute and look for the good in each day. You will find there is always something that will make you happy. You can't wish for something better to come along. Enjoy life now. Enjoy where you are and the many blessings you receive each day.